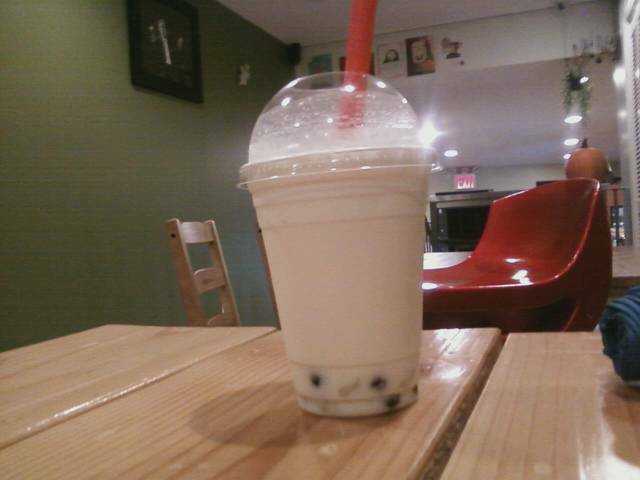 My cravings for bubble tea are intense. Not just a simple “Hey, I could go for some peach bubble tea right about now.” It’s more like “I MUST HAVE SOME NOW.” So, you can imagine my joy when I read about Beans and Berries on Yelp. Located at 2038 Eastchester Rd., it certainly beats trekking down to 12th and 3rd to my usual spot, (though, I do love Just Sweet very much). The place itself is surprisingly spacious,with long tables perfect for hanging out with a big group of friends. I ordered a mango bubble tea and a chocolate muffin. The bubble tea was okay and the muffin was a little stiff. My friend enjoyed both of them, so it could just be me. I prefer the more fruity tea-like bubble tea as opposed to the milky sort of bubble tea, so, yes, I’m biased. The muffin was stiff, like it had been out all day. The woman working behind the counter was friendly and polite, plus they’ve got wifi. I also saw that they carry a variety of healthy and organic products, which is always great. I really like the ambiance of BnB and it’s so close by, so I’m certain I’ll be back, but I think I’ll just order something different.